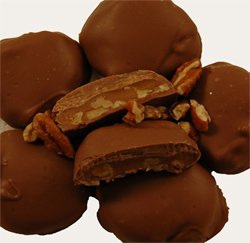 These classic chews feature creamy caramel, and crunchy pecans with a dollop of Dorothy's luscious Swiss chocolate atop. We think they look like well -- paw prints. 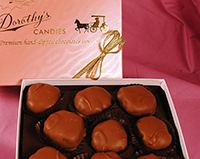 Dorothy's classic paw prints feature pecans and caramel. Assorted features those plus our new additions: almond and cashew.